It seems that the people who have managed to get into power in this country simply cannot take seriously the importance of the natural world to climate, aesthetics, society and human survival. Money eclipses everything in their Growth Lobby paradigm, including democracy. Kristina Keneally the NSW Planning Minister on Friday gazetted amendments to the SREP 30 the zoning plan for the ADI Site. Under the NSW Environmental Planning and Assessment Act the Minister could, based on submissions received from the public, amend SREP 30 any way she saw fit. We called on her to use her planning powers to protect a further 100 ha of Cumberland Plain Woodland by rezoning land from urban to conservation (E2 Environmental Conservation was proposed - therefore no cost to government). Nearly 300 ha of regenerating bushland is zoned urban by SREP 30 and will be cleared so our proposal was a compromise in the hope that we may just get some support from the NSW Government. It would of reduced the development by 1000 dwellings = $100 million that Delfin would of lost. As a result of Fridays gazettal of SREP 30 Penrith Council now has the green light to approve Delfin Lend Leases massive Western and Central Precinct Plans (suburbs). This equates to 3400 lots. Council planners are now rushing to prepare for next Monday night the 9th March when a Report will come before the full Council urging that they approve both plans. We recently met with Council Planners about Delfin Lend Leases abysmal plans. Despite raising numerous issues it was obvious they just don't care. They had no valid responses to our questions. Talking to them was like talking to the developer. Q's such as 'Delfins tree survey identifies 20000 trees - will these be removed? Answer - Don't know. Q's What are you going to do about the fact Delfin have a 3.8 ha shortfall in the provision of public parkland (open space) within the Western Precinct. Answer - Delfin can use the Regional Park to cover the shortfall. Apparently only 40 comments were received on the Precinct Plans so they are cocky that there will be little public opposition from here on. Personally I am quite disappointed that such a massive ecological disaster could only attract 40 comments. So if you are not completely over it and still have some concern then do what you can. 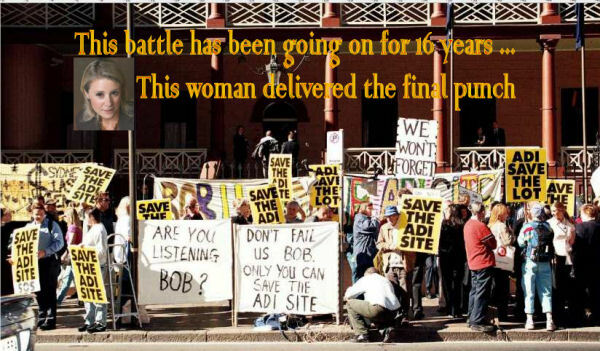 It would be good to wind up this 16 year campaign (arguably one of the longest resident campaigns) next Monday night with a packed public capacity giving Penrith Council what they deserve. You may be interested to know that Blacktown Council refused to commit to the acquisition of the Norman St bushland at Prospect. Council voted unanimously. They came up with some excuse to make continued representation to State and Fed Gov'ts to obtain funding. I have one bone of contention with this article. Of course,realistically it would be a a difficult fight to win from this point on, the fight to save the ADI Parklands should never be declared over until the bulldozers have completed their terrible work. In past decades, protests have succeeded in stopping such environmental vandalism. Whether or not these precious parklands are saved,those responsible for this must be held to account for their actions. BTW, I was present at that protest back in 2004, when I lived in Sydney for a few short months. Although I can't recognise myself in that photo, I can recognise others. The fact that Bob Carr was such miserable coward on that day by refusing to come out to talk to the protestors is one of many reasons why I have such a low regard for the man and question his avowed commitment to the environment. The only way I can explain Carr's utterances in favour of the environment on other occasions and his occasional actions which were truly beneficial to the environment are as cynical ploys to provide the necessary fig leaf of environmentalism that would bring onside a constituency that would otherwise have been hostile to his Government. Whatever may be the true explanation for Bob Carr's starkly contradictory behaviour as Premier of NSW, it will be extremely difficult to ever learn the truth, because of the way Bob Carr carefully avoids ever putting himself in situations where he would have to justify his actions to either the media or the broader public. .